The following series of tables have a place among the most significant code findings to date. This series simply starts with the three Names of God that are contained in Exodus 6:2 and 6:3, where God is explaining His Names to Moses. Figure 1 shows the best parallel cluster in Torah for all three Names (note: Hashem [the Tetragrammaton actually] appears forwards and backwards). This cluster is in Leviticus 19:15; and the full code extends through the end of this parsha (Torah section), called Kedoshim (Holiness). This parsha deals with morality, with judging righteously and using honest measures; and it exhorts the people "you shall be holy for Me, for I Hashem am holy". The source passages in Exodus, where God is introducing His Names, lead up to the following: "And you (plural) will know that I am Hashem your God" (because I will rescue and redeem you from Egypt, and take you to Me to be your God - read through Exodus 6:7). In fact, to emphasize the point, "I am Hashem" is written several times in this section of Torah. There are more surprises here (Figures 3-6). Interjection on January 7, 2010: there is a new phenomenon in the beginnings of investigation, which might be called maximum interlocking compactness. Notice the area of Figure 1 surrounding the Tetragrammaton (the 4 letter Ineffable Name, which is not pronounced, but which we indicate with the word "Hashem", meaning "the Name"). Figure 2a below reproduces this area and highlights the fact that it contains 6 interlocking occurrences of the Tetragrammaton (2 vertical and 4 horizontal). They are interlocking because 3 of the letters (in darker blue) do "triple-duty" (because they are each shared by 3 of the occurrences). From a technical viewpoint, this is very strong, because there are almost no parameters needed to find such a table. And (in the current case) the Tetragrammaton is certainly near the top of the list of high-relevance key words. There are a handful of cases of the Tetragrammaton forming this kind of maximum interlocking pattern in the Torah. All of them are interesting and are being prepared for display on this site. The above case is positioned precisely at the same special spot originally found in Figure 1, the spot where the other Names of God are clustered. There are 9,686 other spots in the Torah (vertical ELSs for the Tetragrammaton with skip less than or equal to 182, our case). Why should this maximum interlocking case (and the other ones in preparation) be so interesting if there was not some kind of intention behind them? We also see this new phenomenon of maximum interlocking compactness in other codes, for example in Figure 5 here, and in Figure 2b, below. We found Figure 2b by looking for 5 occurrences of the Tetragrammaton rather than 6. Note the amazing triple emphasis in the code on the added word "your God" [singular your], very similar to Figure 2. 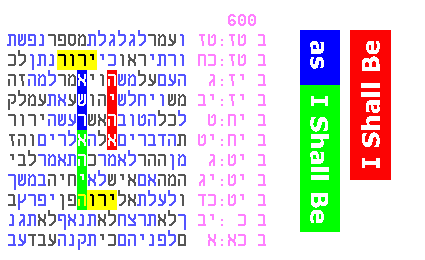 Note also the plain text running through it, in yellow, from Deuteronomy 16:2, "the place where Hashem will choose to rest His Name". II. Thanks to Eric Blum for discovering one other Name of God, probably the most important one after the 3 that we started with. This Name is introduced in Exodus 3:14, and is like a "password", as follows. When Moses first receives instructions from God at the burning bush, to take the children of Israel out of Egypt, he wants to know "Who shall I say sent me, so that the people believe me". God replies "I Shall Be as I Shall Be". 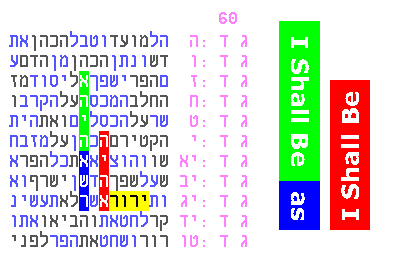 When the original table is opened up by halving the table width, "I Shall Be" appears in parallel with the first 3 names (see Figure 7). We looked further for God's password discussed above, "I Shall Be as I Shall Be". We looked for "I Shall Be" near "as I Shall Be"; or, grouped the other way, "I Shall Be as" near "I Shall Be". It is interesting that one of these has skip 600 and the other has skip 60. The meaning of these skips is unknown at this time. We have now found a third code for the above password ("I shall be as I shall be" - Figure 10). This code contains all three Hebrew words individually, all in parallel. As indicated by the usual pink Hebrew verse markers, the code appears in Leviticus, starting at the end of 23:22 and ending at 23:30. The underlying text gives instructions from Hashem about the holidays of Rosh HaShannah ("Head of the Year") and Yom Kippur ("Day of Atonement"). This code has skip 26 (also indicated in pink), which is the gematria of the Tetragrammaton (thanks to subscriber Joe Mirzoeff for pointing out that the top code on this page [Figs 1 - 7] has a skip of 182, which is 7 times 26). The Tetragrammaton actually appears in all of the password codes, and this result on its own makes this series of codes significant (see yellow highlighted areas in Figures 8-10. Although this word appears about 1900 times in the plain text of the Torah, it appears only 11 times in Figures 8-10, and 9 of those appearances are touching the endpoints of the highlighted ELSs; we first started noticing an apparent "preference" for endpoints about 10 years ago). The Tetragrammaton is also the expression used by Hashem when communicating about His password to Moses in Exodus 3:15, which further explains exactly "Who" Moses should say sent him (this communication began in 3:14 mentioned above). In addition, "Hashem your God" is positioned far more closely and more often than expected (here and above). The above 3 codes on God's password have combined significance well over 1:1000 (Figures 8, 9 and 10). Note 1: We can look at the closest paired meetings (3 of the red and blue words), or the best two such paired meetings (all 5 of the red and blue words). In either case, we are looking here at the most compact parallel occurrence in the Torah for that collection of words. The axis word, the central "I shall be", has an interesting extension in grey meaning future. Note 2: The other interesting extension, 4 letters hey preceded by the preposition "because/that" was highlighted only because it appeared to be non-random. Only later did we notice that this could be a kind of link, or abbreviation, referring to Figure 1 on this page. More about "Hashem your God"
Below is the minimal-skip code for "Hashem your God" [singular your] with a very small skip of 16, which goes right through the verse Exodus 4:8. This verse appears in the Torah soon after the above-mentioned "password" verses. The meaning of the verse reminds us of the repetition that we see in this series of codes and many other series. That repetition increases our sense of surprise (and greatly increases the statistical significance of the "latter signs"). "Hashem your God" makes yet more appearances on "the next page". Notes about the representations: (1) as usual, the Hebrew letter hey is modified for printing purposes [its stem is removed] so that if these pictures are printed and later discarded, these [horizontal] names of Hashem will not be discarded. (2) Since the Tetragrammaton is itself sometimes referred to as "Hashem", in Torah translations for example, we use the same designation. "Hashem" is actually the transliteration of a Hebrew word meaning "the Name".